On 27 March, security services in Crimea carried out the largest house search operation of Crimean Tatar homes since Russia annexed the peninsula in 2014. Beginning at four o’clock in the morning, FSB, Interior Ministry and Russian National Guard personnel searched 27 homes in the Crimean Tatar villages of Stroganovka, Kamenka and Aikavan near Simferopol, as well as the Belgorod district. According to lawyers and witnesses, the searches were carried out with numerous violations of procedure. 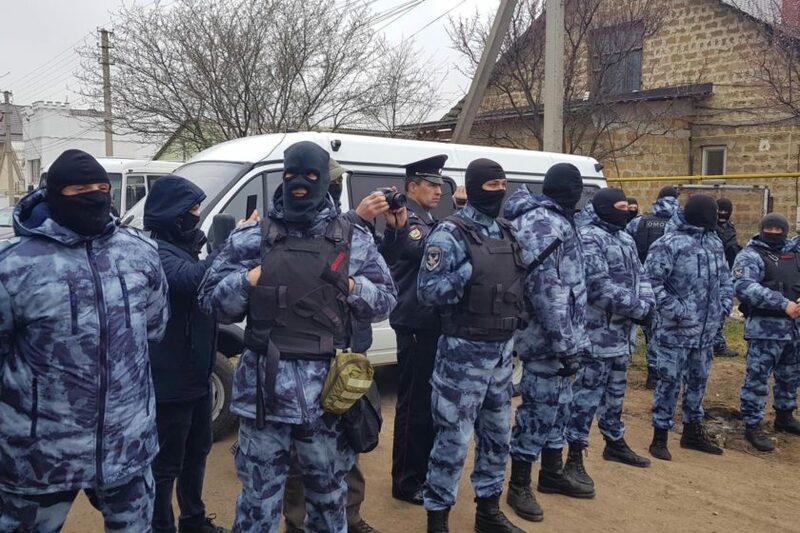 Law enforcement surrounded Crimean Tatar homes, removed individuals’ mobile phones, forbid them from contacting their lawyers or from talking to their families. Russian personnel often behaved rudely, swearing and scaring children and women. They did not present themselves as officers of the law, and did not present a search warrant or search report. In several houses, law enforcement broke down doors, and did not permit residents to observe how the search of other rooms was conducted – it was in these rooms that officers later found banned literature. Aside from books and pamphlets, law enforcement found nothing illegal in any of the houses searched. Later, an FSB press office stated that a “significant amount of propaganda materials, communications devices and electronic carries of information” had been confiscated. According to the FSB, these items had “been used in the course of terrorist activity”. Meanwhile, having found out about the operation from social media, neighbours, relatives and activists, including Crimean Tatars from other villages and cities, gathered outside the encirclement. In Stroganovka, law enforcement ordered the crowd to disperse, threatening administrative charges for participation in an unsanctioned public event. In Kamenka, law enforcement forcefully detained two Crimean Tatars, Eskender Mamutov and Emil Ziyadinov, for filming the police on their mobile phones. Later that evening, both men were sentenced five days of administrative arrest for “minor hooliganism” and a 500 rouble fine for “not complying with the legal request of a police officer”. By midday on 27 March, Russian law enforcement had taken 20 people to Crimean FSB headquarters on suspicion of their involvement in Hizb ut-Tahrir, an Islamic political organisation. In Russia, Hizb ut-Tahrir is a designated terrorist organisation, but in Ukraine it is allowed to operate legally. Four more Crimean Tatars – Remzi Bekirov, Osman Arifmemetov and Vladlen Abdulkadyrov from Stroganovka, as well as Edem Yayachikov – were not arrested at the time, as they were not at home at the time of the searches. Law enforcement closed off Stroganovka in search of these suspects, setting up checkpoints outside the village. Prior to this, they visited all the houses in the district and, according to witnesses, broke into houses where no one was home. On the morning of 28 March, Bekirov, Arifmemetov and Abdulkadyrov were detained in the Russian city of Rostov-on-Don. The whereabouts of Edem Yayachikov are unknown. His wife Susanna has filed a report that her husband has been kidnapped. Lawyer Edem Semedlyayev believes Yayachikov has been detained by FSB officers, and is concerned for the life and health of his client. In the five years since the annexation of Crimea, Ukrainian, Russian and international human rights organisations have reported the fierce persecution of dissidents on political and religious themes. Activists, whether pro-Ukrainian or those who oppose the local authorities, are mostly prosecuted under extremism legislation. These cases include those of RFE/RL journalist Mykola Semena, deputy chairman of the Crimean Tatar Mejlis assembly Ilmi Umerov, or Sudak anti-corruption activists Dmitry Dzhigalov and Oleg Semyonov. At the same time, representatives of religious groups are imprisoned on terrorism charges. The Crimea Hizb ut-Tahrir case is the largest in terms of the number of people charged and convicted on the peninsula. In December 2018, a Russian military court in Rostov-on-Don sentenced eight Crimean Muslims from Sevastopol and Bakhchisaray to terms of between five and 17 years. Another five groups – 23 people in total – are under pre-trial investigation or in court. Ukraine deems them all political prisoners. These men spend the majority of their time in terrible conditions in Simferopol pre-trial detention centre. Here, many defendants’ health has significantly deteriorated. Some of them, such as Arsen Dzhepparov and Uzeir Abdullayev, are now barely alive due to the lack of medical attention. Together with the 24 new suspects, the number of defendants in the Crimean Hizb ut-Tahrir cases has reached 55 men – the vast majority of whom are observant Crimean Tatars. Prior to annexation, Crimean law enforcement showed no interest in supporters of Hizb ut-Tahrir; the latter regularly held conferences and organised demonstrations. Russian law enforcement explain their investigations by referring to the declared aim of this movement (“spreading Islamic ideology across the whole world”), but choose to ignore their methods, which are non-violent. Radical Islamic groups have previously criticised the party for “diverging from jihad”. Amnesty International, Human Rights Watch, Memorial Human Rights Center, Civic Assistance Committee and the Sova Center systematically declare that the offences, which the defendants are charged with, and the sentences they receive under the Russian Criminal Code are disproportionate. They have declared the defendants political prisoners and call for their immediate release. “These are what we call ‘serial’ cases. The FSB gets ‘big results’ (dozens of convictions) with minimal effort, carrying out prosecutions en masse where no crime has been committed,” notes the Memorial Human Rights Center. According to Memorial, 251 people in Russia have been imprisoned in these kind of cases – although this list is “far from complete”, the center says. In effect, the criminal cases against Hizb ut-Tahrir are based on “thought crimes”. The investigation does not need to prove whether the defendants prepared or even considered a carrying out a terrorist act – it’s enough to call them adherents to the ideology of Hizb ut-Tahrir. But the FSB in Crimea often has difficulty doing so. The whole array of evidence for each group of defendants consists of insubstantial, according to the defence, forensic psycho-linguistic and religious analyses. These forensic analyses are carried out by “friendly” experts, who examine secret video footage of defendants talking about political and religious themes from the point of view of Islam. The evidence also includes testimony from several secret witnesses, whom defendants recognise as people wishing them harm or people scared by the security services. Finally, the evidence includes Islamic literature and notes confiscated during house searches – the majority of these materials are not banned and prove nothing but the faith of their owners. “The investigation claims that Hizb ut-Tahrir’s aim is to bring a world Caliphate to power by recruiting supporters,” says Alexey Ladin, who represents Yalta human rights defender Emir-Usein Kuku. “According to the investigation, when a district has more than 50% of [Hizb ut-Tahrir] supporters, they move to the second stage of their mission: taking power by a peaceful or violent methods. A group of six people [defendants in the Yalta Hizb ut-Tahrir case], who were under surveillance by the security services for half a year, recruited three people, according to the investigation. “It’s obvious that they [the judges] looked at this mountain of falsifications and decided to free themselves of such a dirty case,” another lawyer commented on the Yalta case. Lawyers and Crimean Tatars call these most recent searches and detentions an attempt to destroy Crimean Solidarity – an organisation of relatives of political prisoners, activists and lawyers in Crimea. It was formed in April 2016 in order to support the families of defendants – both in terms of covering the cases and raising funds. For three years running, Crimean Solidarity has held monthly meetings where participants discuss the latest news from the trials of political prisoners, the needs of their families, activities for the children of prisoners, and strategies for informing their audience about the situation in Crimea. Most people detained on 27 March are activists who have been live-streaming house searches for years, holding solitary pickets, helping the families of detainees, attending court hearings for political prisoners and organising supplies for them in pre-trial detention. Several of those recently arrested have long come to the fore because of systematic pressure from the security services. For instance, Remzi Bekirov, an activist with Crimean Solidarity, has been sentenced to administrative arrest twice for “participating in an unsanctioned public meeting” (standing outside the house of activist Marlen Mustafayev during a house search) and “distributing extremist materials” (for two video clips saved on VKontakte in 2009-2010). Activist Riza Izetov has been detained three times, and his house was searched in 2017, but he has also previously been sentenced to administrative arrest for “participating in an unsanctioned public meeting” (supporting activist Marlen Mustafayev during a house search). Another activist, Ruslan Suleimanov, has also been sentenced twice on administrative charges. These aren’t the first prominent Crimean Tatars to be arrested on terrorism charges. In February 2016, human rights defender Emir-Usein Kuku was arrested in the Yalta Hizb ut-Tahrir case – Amnesty International has since recognised him as a prisoner of conscience. In October 2017 and May 2018, Marlen Asanov, a businessman and charity organiser, and Server Mustafayev, rights defender and co-coordinator of Crimean Solidarity, were arrested in the Bakhchisaray Hizb ut-Tahrir case. Since March 2018, citizen journalist Nariman Memedeminov, who worked on the media arm of Crimean Solidarity, has been in pre-trial detention for “propagandising terrorism” (the evidence is several YouTube clips from 2013-2014). But the latest arrests are the first time an operation of this scale has been carried out. According to new amendments to Russia’s criminal legislation, they could face up to 20 years in prison. The remaining five men – Remzi Bekirov, Riza Izetov, Ruslan Suleimanov, Shaban Umerov and Farkhad Bazarov – are being treated as “organisers of the activity of a terrorist organisation”, which could mean life imprisonment. By the evening of 27 March, the Kiev district court in Simferopol had started choosing the means of restraint for the detained activists. These hearings were held over two days, and practically all of them were held behind closed doors. Riot police officers surrounded the building, pushing away the more than 300 people who came to support the detainees – and warning them of possible administrative charges for an unsanctioned public meeting. On 28 March, law enforcement officers detained Tair Ibragimov, who was participating in a spontaneous protest in support of Crimean Solidarity – people were photographing themselves with placards “We are Crimean Solidarity” or “Give 166 children their fathers back”. Ibragimov was later released with a 15,000 rouble fine. “The pressure brought to bear on Crimean Tatars and Muslims can be felt before you even get to the court,” said Emil Kurbedinov, the lawyer for Tofik Abdulgaziyev. “Ruslan [Suleimanov] told the court that the administrative prosecutions for his presence near the home of Marlen Mustafayev during a search and a solitary picket, as well as the current criminal investigation, are links in a single chain and amount to pressure not only on him, but on Crimean Solidarity and the whole Crimean Tatar people,” said Suleimanov’s lawyer Lilya Gemedzhi. Investigators requested that the court place all 23 detainees in pre-trial detention, despite their age, chronic medical conditions and children. Many of the men have small children and elderly parents who need their care. Three have pregnant wives. “We presented the court with evidence that my client [Bilyal Adilov] supports five underage children, and that he is the family’s only breadwinner,” said Galina Akimova, Adilov’s lawyer. “His mother has diabetes, his brother cannot work due to a disability. Yet the court did not pay attention to our requests, and considered them insufficient grounds for house arrest.” Akimova also stated that the case has no evidence confirming the guilt of her client. By evening on 28 March, Simferopol’s Kiev district court had sent all detainees to investigative detention until 15 May. Not one of the 23 men admitted their guilt. According to detainees’ lawyers, after law enforcement officers transported the men, they did not use violent conduct towards them, with the exception of the three men detained in Rostov-on-Don. Vladen Abdulkadyrov stated to the court that officers had beaten him in the legs. On the following day, lawyers could not find their clients neither in Simferopol pre-trial detention, nor in temporary detention centres, and relatives could not get their parcels accepted at jails. By evening on 29 March, it became clear that the Crimean Tatar detainees had been removed from the peninsula, and this information was confirmed by Crimea’s human rights ombudsperson Lyudmila Lubina. The investigators did not explain the reasons for this decision, and did not reveal the whereabouts of the 24 men (including the missing Edem Yayachikov) neither to their families, nor legal representatives. According to initial information, the men have been transferred to Rostov oblast and placed in five separate investigative detention centres. Sergei Makhnev, head of the FSB’s investigative group on this case, has not responded to requests for information. On 1 April, lawyer Lilya Gemedzhi managed to visit Ruslan Suleimanov, her client, in Rostov Investigative Detention Centre No. 4. As it turns out, defendants were sent to Rostov by air, and were not informed where they were going. When defendants requested that their relatives be informed, and that they wanted to meet with the Ukrainian consul in Rostov, they were told “it wasn’t permitted”.